Remember that you are amazing and that you already possess everything you need to lead a fulfilling life! We all need little reminders throughout the day to help ground us so we can be our best selves. Once we find that perfect place of recognizing our own value, we can truly find joy and peace in each day. Our Life Intentions collection is here to guide you with little reminders so you can feel empowered to take on life’s most difficult challenges. Use our “Loved” Bath Bomb as a reminder that you are enough, and all the love you will ever need can come straight from within. Center yourself in a warm bath with fragrances of jasmine and fresh florals. 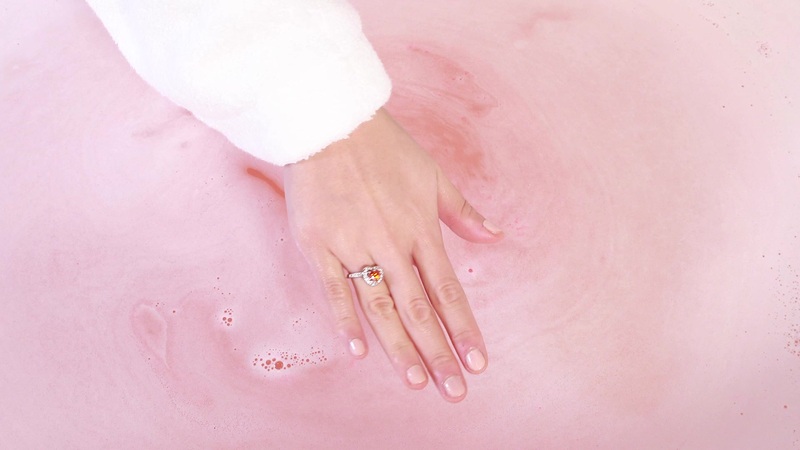 Inside each Bath Bomb, you’ll discover 1 of 6 self-affirming, stackable rings. The Swarovski crystals used in the collection are amongst the rarest of the crystals offered and were selected to evoke a sense of calm and tranquility. Air Blue Opal and White Opal are semi-transparent with warm flashes of yellow from deep inside each crystal. The soft blue found in the Light Sapphire Crystals was created to look like a Cornflower Blue Sapphire, a rare and special light blue. The Crystal Blue Shade stones were created to perfectly mimic the look of a natural blue diamond. The blue color is subtle and there is a flash of yellow and blue on the surface of the crystal that replicates the reflection of light on a diamond surface. You’ll find a different intention etched on the side of each ring so you can go through each day with empowering reminders. Loved Scent: Apple skin, Georgia peach, green mandarin, jasmine, elm wood, & earthy musk. We’ve partnered with Girls’ Voices, an organization that empowers girls around the world to become leaders through the power of digital media and education. Every purchase provides a day of schooling for a girl.